Casey Kasem’s American Top 40 – The 80’s. 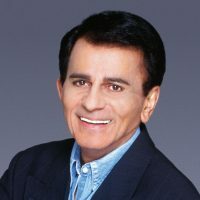 When you think “radio legend,” you think of National Association of Broadcasters Hall of Fame inductee Casey Kasem. On the air for over 50 years, Casey founded the radio staple American Top 40, which continues to be the most relevant source for pop music hits. To this day, there is no better way to experience classic hits than with Casey and the Classic American Top 40 Countdown. Kasem’s friendly, “crackling” voice style took him to the top of his profession. The man, who once dreamed of being a baseball player but ended up as a radio sports announcer instead, was the youngest member ever inducted into the Radio Hall of Fame. He has his own star on Hollywood Boulevard’s Walk of Fame. In 1997, Billboard magazine honored him with its first-ever Lifetime Achievement Award. His alma mater, Wayne State University, presented him with its “Distinguished Alumni” award. He received the 1989 “Martin Luther King Drum Major” award from the Southern Christian Leadership Conference and, in 1990, the NAACP’s “Image” award and the “Ellis Island Medal of Honor” award. Kasem passed away on June 15, 2014. He is survived by his four children and his wife Jean.